Home > 2017 > 01/12 > 2015 Draft Class: Who to sign? 2015 Draft Class: Who to sign? Although it’s January, that doesn’t stop organizations from looking at the long term picture. This week, all teams will be having their amateur scouting meetings to discuss and breakdown the 2017 draft class. They will also have meetings to figure out what they currently have in the organization – which prospects made noise, which ones disappointed and what to keep an eye on going forward. Here at Canucks Army, we have begun our mid-season prospect rankings, where we break down and discuss all the prospects currently within the organization. Given all this, I figured it was worth taking a look at the 2015 draft class of the Canucks and figure out who is worth signing to entry level contracts. Outlined below are some of the article’s within the CBA that pertain information on how long the Canucks retain the player’s rights. If nothing is noted, the Canucks would possess the prospects rights until June 1, 2017. This one is the no-brainer of the group, once Boeser decides to turn pro, the Canucks will sign him. Although he has seen some struggles this season, before suffering a wrist injury, there is no doubt that he is currently the best forward prospect in the organization, and arguably the best prospect in the organization. 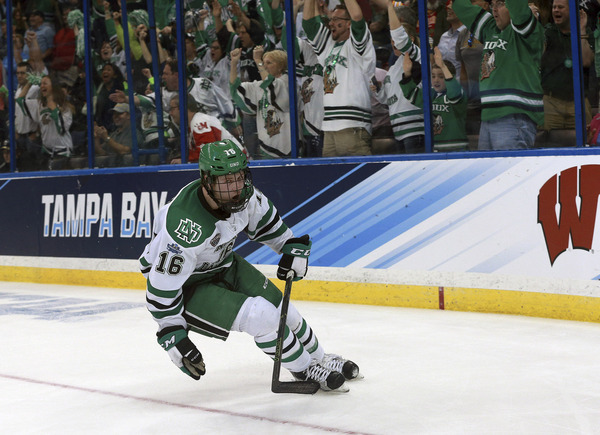 In Boeser’s case, the Canucks selected him when he was 18-years-old, was committed to University of North Dakota, and attended UND prior to June 1st, 2016. Thus the Canucks retain his rights until August 15th, 2019. Lastly, based on all indications, including Boeser paying his own way to Canucks development camp, it’s fair to believe Boeser doesn’t intend to explore this route right now. 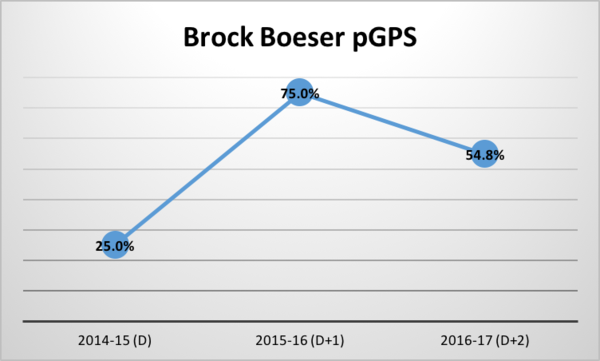 If Boeser returns to UND for his senior year in fall of 2018, then it’s something to be aware of, but at this point, it’s a moot point. At the conclusion of his draft season, 25.0% of comparable players went onto becoming NHL regulars. His breakout freshman season with North Dakota made that number explode to 75.0% last year. As mentioned above, he has seen some struggles this season to put up points, and that number has fallen to 54.8% of comparable players becoming NHL regulars when matching his point totals in his D+2 season. It’s important to apply context here – Boeser has been battling a wrist injury for an unknown time, and there was massive turnover for North Dakota. Both of things likely contributed to a lower a PPG pace. 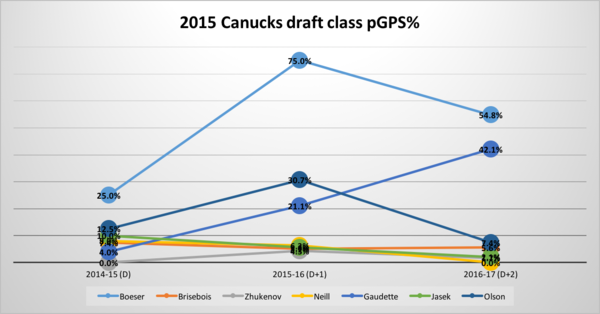 Given that this was an exploration on if the Canucks should sign their 2015 draft class, we can finish the discussion on Boeser with a resounding – Yes, they should sign him. 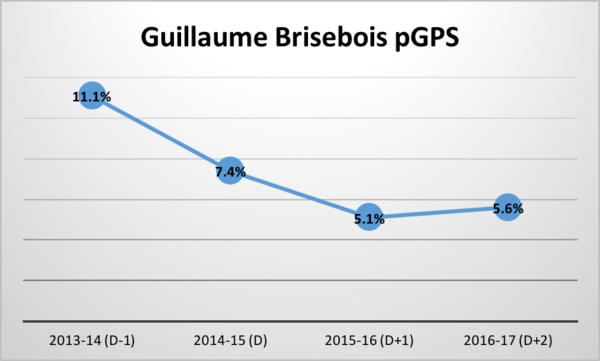 This exploration of figuring out who to sign from the 2015 draft class isn’t going well – as Guillaume Brisebois is already signed to an entry-level contract. But this will give us an opportunity to talk about Brisebois a bit. There were hopes that he would see an uptick in offence with his move, but the increase has been minor, with him posting 0.59 PPG this season compared to 0.50 PPG last year. With that said, the Islanders have loaded up at the trading deadline, including adding Canucks prospect Carl Neill, so it’s possible that Brisebois will have a big second half. As always, we need to use the numbers in context. The Canucks are very high on Brisebois and feel that he has a long future ahead of him, which is why they already inked him to an ELC. Unfortunately only 5.6% of comparable players went onto becoming NHL regulars, which doesn’t look good, but it’s fair to think that Brisebois will be given ample opportunity to buck the trend and be successful. Ideally Brisebois will see a better second half offensively, a long QMJHL playoff run, and then turn pro next year. The above images were separated due to a page break in the CBA. So since the Canucks drafted Dmitry Zhukenov in the 2015 NHL Entry draft, they retain his negotiating rights until June 1, 2019. If by that time, they have not signed him to an entry-level contract, he would become a UFA. Zhukenov has had a decent transition to the QMJHL since being selected in the 2015 CHL import draft – last season, he posted 57 points in 64 games and is hovering around a point per game so far this season. Chicoutimi wasn’t a big buyer at the QMJHL deadline, so there isn’t going to be a huge influx of talent. The young Russian centre presents an interesting mix of skill and work ethic that will likely translate to the AHL level, but it will remain to be seen if he can take another step and be a legitimate NHL prospect. At this time, it’s hard to see Zhukenov carving out an NHL career, but if he does, it would be in a bottom six centre role. As we can see, Zhukenov’s comparables peaked last with 4.3% becoming NHL regulars. That number has fallen even farther this year. Given his unremarkable production and the fact that the Canucks retain his rights for another 2.5 years, it would probably be wise to let him return to the QMJHL as an overage player next season. On the flip side, given the lack of prospects in Utica, it might be worth it to have Zhukenov turn pro next season. The best of both worlds would be to leave Zhukenov unsigned and have him join Utica on an AHL deal. If things don’t work out, they still have his rights and could get him back to the QMJHL. If things go well in the AHL, then sign him to an ELC. Selected after his D+1 season, Carl Neill is an interesting case, as it appears he may be just a late bloomer that the Canucks were able to snap up. After mediocre numbers in his draft season (22 PTS in 65 games), Neill exploded for 40 PTS in 2014-15. It was enough for the Canucks to take him in the fifth round. The young rearguard returned to Sherbrooke for the 2015-16 season and saw an increase in offence to 50 PTS in 64 games. He was a leader on and off the ice, and that was reaffirmed by being named the captain of the Phoenix. The Canucks did have the option of assigning him to Utica this past year, but given the logjam there and the chance that Neill could get moved in the QMJHL – they sent him back. They were correct in their assumptions, as Neill was transferred to the Charlottetown Islanders this past week. Carl Neill continues to lead the QMJHL in defenceman scoring with 46 points. 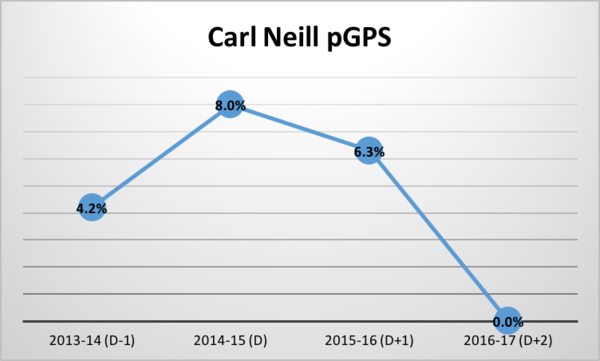 Despite all these offensive production increases, Neill’s pGPS has dipped every year since being selected. There are a few reasons for that, the first being the QMJHL success rate is generally lower. So, you will see defenceman put up big numbers in the QMJHL, and then struggle to translate that further. Another reason, and more specific to Neill, is that players who do put up these points usually graduate to pro hockey during their D+3 season rather than returning to the QMJHL. Usually, there is a reason why they were returned as an overage player, and for Neill, that is concerns about his skating and defensive awareness. Both have seen improvement when compared to last year, but there is still a valid question on if he can take the next step. With all that said, the Canucks would probably be wise to sign Neill to an ELC and see what happens in the AHL next season. There will be quite a young group for Utica next year, so Neill would just need to get himself into a regular spot, and work his way up. 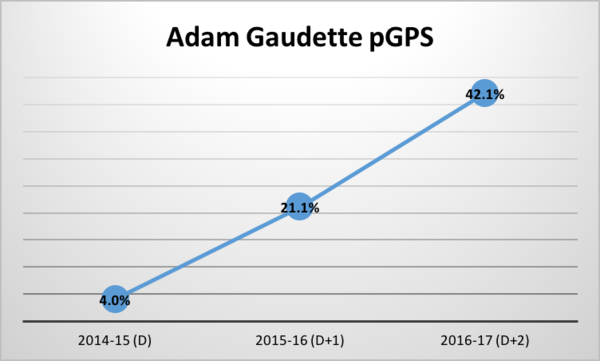 The last few players have seen a downward trend when using pGPS, while Adam Gaudette has seen the opposite. His pGPS has skyrocketed since his selection in 2015. There is no debating that Gaudette put up average numbers during his 2014-15 season in the USHL. 30 points in 50 games in the USHL isn’t something worth noting. But the Canucks definitely saw something in the young pivot, and since he was committed to the NCAA, figured that he would be able to round out his game. After struggling to start the year last season, Gaudette has been on a tear for the last 12 months. To the point where he is in the conversation as a top 5 prospect in the organization. Gaudette is a prime example of a player that the statistical analysis may not look fondly on, but with some scouting and qualitative analysis, will be worth taking a risk on. Like Boeser, the Canucks retain his rights until August 15, 2019 – it will just depend on when Gaudette wants to turn pro. If I had to hazard a guess, he will turn pro next summer (2018), and the Canucks will quickly sign him to an entry-level contract. There hasn’t been a more frustrating player to track than Lukas Jasek, and can only imagine it’s even more frustrating for the team that used a draft pick to select him. The reasoning behind this would be because the Canucks haven’t been in control of his development. There was hope that Jasek would come over this year to the CHL via the import draft. But that was stopped by Jasek’s Czech team, HC Trinec. Which makes sense, as he was under contract for the 2016-17 season and had been a regular with the Extraliga team, albeit on the fourth line, for the majority of the season. This season, though, he has hopped between Extraliga, the division two team, and the U20 team. It has limited the amount of games he has played and has resulted in a variance in competition. Jasek did represent the Czech Republic at the World Juniors, so he is one of the best young players from there. He needs some stability to develop, and that’s probably why the Canucks hope to get him signed this summer and get him to the AHL next season. There would be ample opportunity for him to play with the Comets in 2017-18. Given all this uncertainty, pGPS doesn’t look fondly upon Jasek. If Jasek was in a better situation in the Czech Republic, I might’ve suggested giving it one more year before exploring signing him. But given the lack of playing time, the Canucks desire to sign him is probably the best course of action. Last but not least is Prince George Cougars defenceman, Tate Olson. Taken with the 210th overall pick in the 2015 NHL Entry Draft, Olson had a fantastic D+1 season, to the point where Craig Button had his one of the Canucks top 5 prospects. This was due to Olson posting 47 points in 65 games for the Cougars last year while being their #1 defenceman. Unfortunately, so far this season, Olson has been struggling to put up offence and thus his pGPS reflects that. The Cougars have loaded up at the WHL deadline with hopes of making a run for the championship this season. This should help Olson have a good second half, and then ideally boost his production. The Canucks have been reasonably high on the 7th round pick – but at this point and based solely on his regression in offence this season, the argument could be made that he isn’t worth an ELC. However he is and always was a project, and he has shown enough that suggesting he could be a good depth defender isn’t out of the question. That 30.7% success rate during his D+1 season is extremely encouraging. In the end, though, I do expect the Canucks to sign Tate Olson to an entry level contract. The Canucks are in a good situation for next year regarding total contracts – so signing all of the players above wouldn’t cause an issue. The last point that needs to be made is that although these players appear to be worth signing to an entry level contract and having longer looks – does not mean that they are ‘top prospects’ or will be NHL players. It’s just prudent management to ensure that you keep your picks within the organization and within your development system for a few years. All of these players, including Boeser, will have to take another step (or two, or three) before being impact players at the NHL level. This article is great. One note, though – your pGPS percentages on the graphs are unreadable. Make the text black instead of white, then we can see what the actual numbers are. Yeah – they looked ‘okay’ in the preview, but now in the post – not so much. I will update shortly. Edit: All fixed – thanks for letting me know! Good stuff. Obviously a lot of work went into it. These types of articles make CA worth reading. Agreed, this is the kind of stuff I come here for. Thank you Ryan Biech, one can always depend on you. Thanks for posting this report. Keep in mind that if the Canucks get 2 NHL players out of the 2015, then we are slightly above league average. Best bet would be Boeser (1st line winger) and Jasek (as a checking winger based in his WJC performance). I wouldn’t count out Zhukenov – heard the Canucks are extremely high on him, think he could develop into a Markus Granlund type. Which for the 4th round is a great find. Don’t know enough of him or seen enough highlights to make an educated guess on Zhukenov. The little that I have seen us that he is more of a North American styled player. The only thing I caution is that we don’t see a lot of these Russian “bottom six forwards” stay in North America when they can ply their trade in Europe (specifically the KHL). As much flak as I give GMJB for his asset management, there is no doubt about his drafting acumen. Tryamkin was a good late round pick up. If we can average 2.5 players per draft play 200NHL games, I believe we will be amongst the best drafting teams in the league. And that is not to discount the 2-3 AHL players from each draft that we need, to provide a competitive environment for our top prospects to learn their trade. 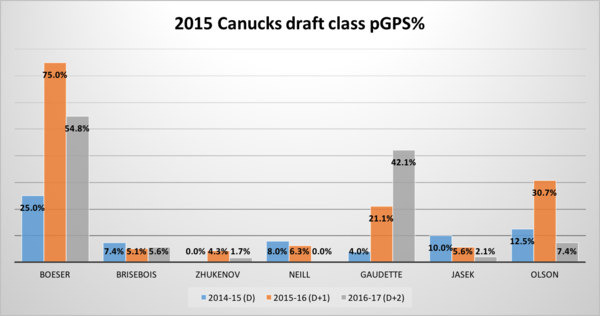 Gaudette is a very intriguing prospect. Good all-round skills with NHL size and speed. He almost sounds like a Ryan Kesler clone. He could be our 3rd line center in a year or two. Great article – as always, Ryan – think both Jasek & Zhukenov are potential dark-horses with great upside. But what about Curtis Valk? When will Benning sign this kid to an ELC & give him a look? High end playmaker & profound competitor. Excellent work – looking forward to your take on Boeser’s 5 points in 2 games coming back from injury in your prospects update. Wow – just great, more ifs, whens and maybes and lots of MEDIOCRITY here guys… the curse of the Canucks has already STRUCK BOESER and frankly I don’t SEE a JIMMY VESEY, CONOR SHEARY or MATTY TKACHUK here, let alone a McDavid, Matthews or Laine type top pick that that it takes to BUILD A WINNER. Just telling it like it IS fellas. This list is depressing… YEARS of mediocrity ahead guys – I KNOW IT, but DO YOU? Prison more likely. Heard his job was chief soap picker-upper. Can you be a fan of another team please? Interesting article, as I did the same thing 3 days ago. Agreed with you on Boeser, Zhukenov, Olson and Neill, whereas I had them waiting till next year on Jasek and signing Gaudette this year. I don’t think they’ll wait till 2018 to sign Gaudette, but your point on controlling Jasek’s development is well taken and they may opt to sign him this year. I also think they will try to sign Brett McKenzie from the 2016 draft class, as he has a 1997 birthdate, but they will wait on other 2016 picks Jakob Stukel and Rodrigo Abols, both of whom also have 1997 birthdates. Another consideration is the total number of players under contract is limited to 50, so they need to consider how many of their current UFA’s and RFA’s they resign, which could impact how many of the draft choices they in fact can sign. Thank you – an entire article without one instance of anti-Canuck douche-snark. Reid, Skille, Megna, Chaput, Larsen, Billins, McEneny, Nilsson, Rendulic, Zalewski, Labate – all on expiring contracts. I’m sure there are 7 guys that we could not resign and fit the entire 2015 draft class in. I would keep Reid (potentially, would like to see him play! ), Skille and Labate from that list. Both Skille and Labate comprise 2/3 of a decent 4th line and/or top six Utica veterans. Boeser is a given. Gaudette is a nearly given. Other signings would depend ENTIRELY on how they perform in prospect and/or main camp. I have no real insight into whether Carl Neill has what it takes to be an NHL player but there is obviously a significant flaw in this analysis. Any defenceman scoring 1.28 points per game in the CHL, even as a 20 year old, has more than a zero percent chance of making it. He is listed at six one 200lb. pGPS is expressed as a percentage, though it’s based on historical information. Ryan talked about how rare it is for Defensemen in their draft + 3 year to stay in junior. When factoring that context, pGPS is merely stating that such a player has yet to make it to the NHL – Carl Neil would be the first. It’s not that I don’t understand it’s that pGPS is not a valid estimation of probability when there is really no precedents to compare a prospect to. Ryan did explain that Neill’s situation is somewhat unique but didn’t qualify how this might impact the validity of the result. If there has never been a 200 lb 20 year old defenceman score 1.28 ppg in the Q before the better answer is insufficient data not 0%. At the very least It would be nice to know the number of comparable players used in the analysis. This was an interesting article but we still don’t have much insight into the probability of Neill making the NHL. There was no flaw in the analysis – I said there was zero matches, but Neill maybe able to buck that trend because he will be given ample chance to do so next season in Utica. But there is a reason why he was passed over in the draft the first time, and why he was assigned back to the QMJHL for his overage year. He has flaws in his game that may hinder his ability to make it as an NHL player. You may not feel the data is correct, but it is. The data is a tool to use to look at a player, the key is using all the factors to analyze the player. I appreciate you responding Ryan but I’m still a bit confused. Were there 13 matches or 0 matches? Did any of the matches used put up anything like the points Neill is? I understand the data is correct and I perhaps wrongly implied you performed the calculation incorrectly. I also understand high end 20 year old prospects don’t get sent back to junior. I still believe however the data set is too small to generate a valid result. There were 13 matches who are the same size as Neill, who put up the same PPG rate as Neil at the same age. Zero of those 13 players went onto becoming regular NHL players. Will you guys be taking a look at college free agents worth signing this summer?